The GLAST Users' Committee (GUC) met at Goddard Space Flight Center. Half the meeting was devoted to a beta test of the tools that the GLAST mission will provide the community to analyze GLAST data after launch. The committee also reviewed plans for the Guest Investigator program. The GLAST mission had a special session at the American Astronomical Society's High Energy Astrophysics Division meeting in San Francisco, CA. The primary instrument for NASA's Gamma-ray Large Area Space Telescope (GLAST) arrived at General Dynamics, Scottsdale, Ariz., on September 18 for mounting onto the spacecraft. The environmental tests of the LAT at the Naval Research Laboratory were completed successfully, and the instrument was placed on the shipping container base (see the linked photograph). The pre-ship review will be held on Friday, and on Saturday the LAT will leave for Gilbert, AZ, where it will be integrated onto the spacecraft at the General Dynamics/Spectrum Astro Space Systems facility. All 12 of the GBM's NaI detectors have been integrated onto the spacecraft, and the two BGO are being integrated. NASA scientists and engineers have completed final testing and integration of the GLAST Burst Monitor, a space-based instrument for studying gamma ray bursts. The GLAST Burst Monitor left Marshall Space Flight Center in Huntsville, Ala., on July 24 and arrived safely at General Dynamics near Phoenix on July 27. The Large Area Telescope (LAT) has completed three of the four environmental tests --- vibration testing, electromagnetic interference (EMI) testing and acoustics testing --- at the Naval Research Laboratory in Washington. On July 28 the LAT entered the vacuum chamber for an approximately 40-day thermal vacuum test. After this suite of environmental testing at NRL, the LAT ships to General Dynamics for assembly onto the spacecraft. Integration onto the spacecraft is scheduled for autumn 2006, approximately one year prior to launch. The GLAST Large Area Telescope (LAT) has completed vibration testing at the Naval Research Laboratory in Washington. It entered electromagnetic interference (EMI) testing in early June, and this will last about two weeks. After that, there's an acoustics test and the 40-day thermal vacuum test. After this suite of environmental testing at NRL, the LAT ships to General Dynamics (formerly Spectrum Astro) outside of Phoenix for assembly onto the spacecraft. Integration onto the spacecraft is scheduled for autumn 2006, approximately one year prior to launch. The GLAST Burst Monitor is at Marshall Space Flight Center in Huntsville, Ala. The GBM will have its pre-shipment review. GLAST completed a successful exercise where the simulation and analysis software was tested end-to-end by creating, processing and analyzing 55 days of simulated data. The simulated sky was the APOD picture for Wednesday, May 31. Participants created source catalogs, detected bursts, and determined pulsar periods. This exercise demonstrated that scientists will be able to analyze GLAST data when they become available. 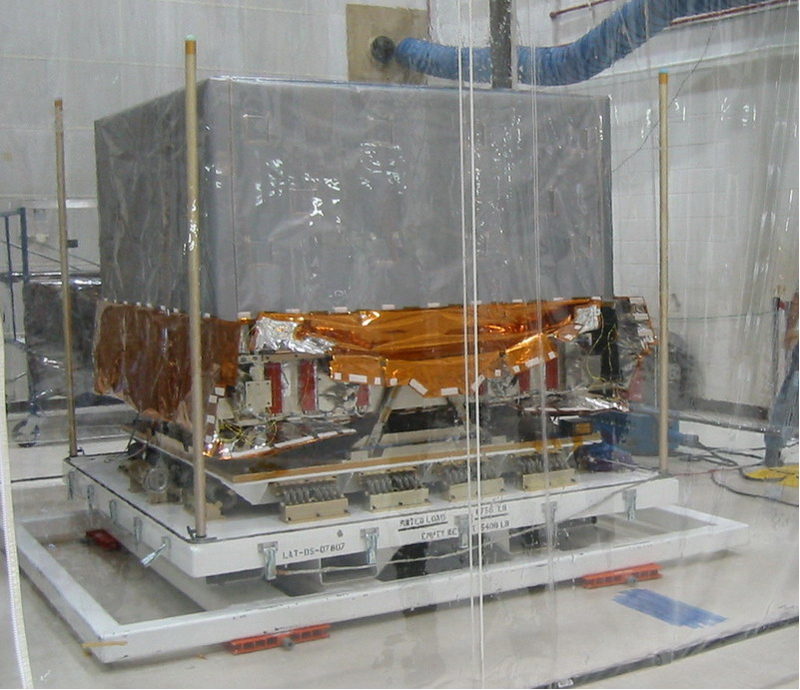 Scientists and engineers have completed assembly of the primary instrument for the Gamma-ray Large Area Telescope, or GLAST, a breakthrough orbiting observatory scheduled to launch from NASA Kennedy Space Center in the fall of 2007. The maturity of the GLAST Project's preparations for operating the mission was demonstrated at a major review held at GSFC. The instrument operations centers and the GSSC presented the plans for producing, ingesting and providing the scientific community with the scientific data, and for implementing the community's observations. LAT observations are simulated, processed and analyzed using the software under development in three campaigns called "data challenges." The second data challenge began March 1 and will end in the middle of May; a kickoff meeting was held at SLAC. For this data challenge 55 days of simulated LAT data were created, as well as simulated GBM observations of gamma-ray bursts. GLAST scientists are now analyzing these data sets with the analysis tools as if they were flight data. A large number of posters were presented covering the capabilities of both instruments and the GSSC's support of the scientific community.